Collagen gives structure to your skin, providing the firm and smooth qualities associated with a youthful appearance. Over time, however, your body’s collagen production may slow, causing your tissues to lose some of their elasticity and to sag. As the year’s pass, your skin may also change in texture, develop scars, and show sun damage. Dr. Vu performs microneedling for Huntington Beach patients to address these aesthetic concerns in a non-invasive way. The technology can improve the skin’s texture, exfoliate dead cells, reduce the appearance of acne scars, and promote collagen development. Dr. Vu can use microneedling to treat the face and neck as well as limited areas around the chest. For more than twenty years, Dr. Vu has guided Huntington Beach and Southern California area patients in achieving their personal aesthetic goals. As a board-certified plastic surgeon, he brings a specialist’s expertise to the care of each person he treats. Patients who choose non-surgical approaches such as microneedling benefit from Dr. Vu’s knowledge of facial anatomy, gentle and precise technique, and comprehensive experience. Dr. Vu and his team performs microneedling for Huntington Beach patients who want to improve the texture, thickness, and overall quality of their skin. He uses the Rejuvapen™, a well-established brand of the technology, to conduct his treatments. A handheld device uses tiny needles to create microtrauma on the surface of the skin. This damage is minor and focused, and it causes the skin in these areas to begin healing. The healing process and collagen development replace skin that had been aged and damaged with new, healthy tissue. As a result of treatment, you can expect your skin to be firmer, more elastic, and more youthful. Microneedling can be an effective non-surgical way to rejuvenate your skin. Our Huntington Beach patients describe the experience as relatively pain-free, and you should see an immediate difference in the quality of your skin. Most patients are able to tolerate treatments with typical anesthetic agent. During your consultation with Dr. Vu, he will discuss the treatment in detail and help you understand the advantages that microneedling offers. He is committed to keeping Huntington Beach patients at the center of their care, and so he will typically review alternatives to the treatment he recommends so that patients can decide the best approach for themselves. In the case of microneedling, patients may also consider the options below. Laser resurfacing applies thermal energy to the skin instead of needles like those used in microneedling. The cells that receive this energy peel and flake away in the days that follow, and new collagen and skin cells develop in their place. Laser resurfacing tends to affect skin at a deeper level than microneedling because of the intensity of the energy it delivers. This may mean a longer period for healing but also a more noticeable effect. Treatments are performed with either a topical anesthetic agent or conscious sedation depending on your needs. A fractional laser applies energy in columns instead of as a single broad beam. Like the needles of a microneedling device, these beams penetrate the skin, but they tend to go to a deeper layer of tissue. Because the laser is fractioned, it can deliver similar beams of energy to a limited area of the skin. The benefit for you is a faster healing time and collagen stimulation. Dr. Vu will typically use fractionated laser resurfacing for a smaller treatment area. 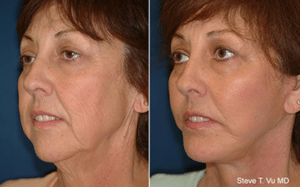 Intense pulsed light can help Huntington Beach and Southern California area patients reduce the appearance of sun damage and skin pigmentation as well as provide a small degree of skin tightening. The technology uses pulses of light energy rather than laser energy, targeting the melanin of damaged skin cells. While your body expels these pigments, it repairs the treated areas with new, smoother skin. Dr. Vu can advise you whether IPL or microneedling is a better option for your needs. During your initial consultation with Dr. Vu, the two of you will have a chance to discuss the aesthetic issues you want to treat and the different approaches available to you. He will spend time talking with you about your goals, examining the areas that you want to address, and learning about your expectations for the results. If you are a good candidate for microneedling, you can typically receive treatment on the same day as your initial consultation. We will apply a numbing cream to the skin we will be treating. This topical anesthetic will desensitize these areas temporarily so that you can be more comfortable during your appointment. After an appropriate amount of time, we will remove the numbing cream and then apply a peptide serum to the surface of your skin. This step will help promote collagen development and healing. Dr. Vu may use one of several different growth factors, including platelet rich plasma and umbilical cord derived stem cells. Vu will perform microneedling in the areas you have decided to have treated. He will use a careful and gentle approach, adjusting the depth of the device for each feature. By the day after your treatment, you should begin to see a difference in the quality, tightness, and thickness of your skin, and this improvement should increase for several weeks. Dr. Vu advises Huntington Beach patients to return for retreatment on a monthly basis so that they can maintain their results. There is no downtime after microneedling. However, Dr. Vu recommends that patients not wash their face for several hours following treatment. This will allow the skin’s healing agents and growth factors time to work. HOW SOON AFTER TREATMENT CAN I BEGIN TO WEAR MAKEUP AND USE SKIN CARE PRODUCTS? The day after microneedling, you can get back to your normal cosmetic and skin care routine. WHAT IS PLATELET RICH PLASMA AND WHY DOES DR. VU USE IT IN MICRONEEDLING? Platelets are one of several components that make up the blood in your body, and they contain growth factors that assist in healing injuries. Platelet rich plasma is a natural part of your blood. We obtain it by drawing a small amount of blood from the patient’s arm. The blood is then prepared to separate the plasma and growth factors from the red blood cells. The concentrated plasma product is them topically applied on to the treated skin or it can be injected under the skin. The purpose of this is to bring growth factors and additional healing agents to the skin to repair the tissue that has been damaged by time and environment factors. Explore a range of non-invasive options for firmer, younger skin. Learn more about microneedling and other solutions through the practice by contacting us online or by calling (714) 848-1133 in Huntington Beach.